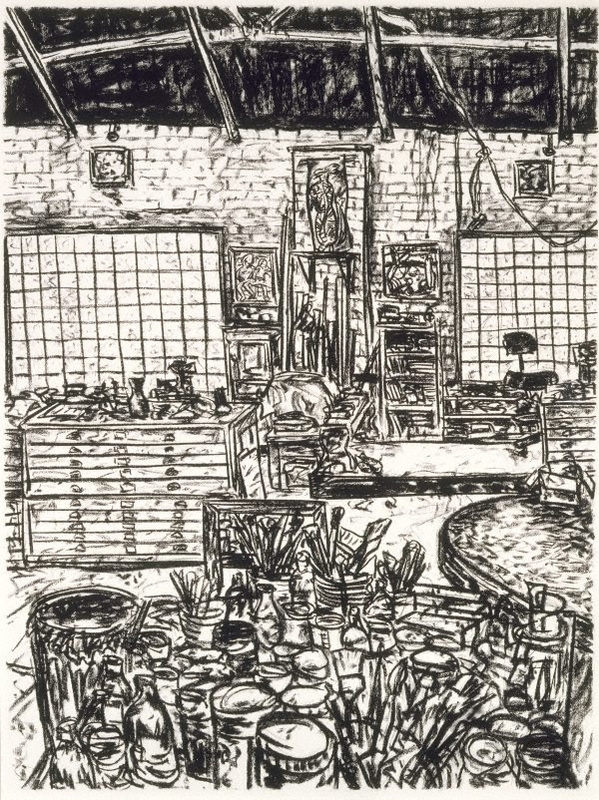 Drawing has been central to Senbergs’ practice since the late 1970s. Kitchen at Smacka’s is a panoramic view of the artist’s studio, a cavernous space in inner Melbourne which had previously been occupied by a nightclub prominent on Melbourne’s jazz scene, named after its owner, Smacka Fitzgibbon. In the first two sheets of the four part drawing, the semi-circular dance floor can be seen, which Senbergs has retained; in the fourth sheet is the old bar. Senbergs only submitted the third and fourth sheets of this quartet of drawings to the Dobell Prize in 1995. After they won and were thus acquired for the AGNSW collection, the artist gifted the first and second sheets of the quartet to the gallery.